The Herald capsized in just 90 seconds after setting sail from Zeebrugge, Belgium, on Friday March 6, 1987. It was on course for Dover when tragedy struck and 193 people lost their lives. 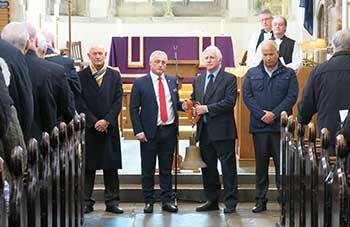 During the service, staff from the Port of Zeebrugge at the time handed over the bell recovered from the ship to Sailors’ Society CEO Stuart Rivers and Brian Gibbons (pictured right), the last survivor to be pulled out alive. The former Bishop of Liverpool, the Right Reverend Bishop James Jones KBE, spoke at the service, which is held annually at St Mary’s Church by maritime charity Sailors’ Society. Bishop Jones told families in his sermon: “There’s no such thing as ‘closure’, nor should there ever be, for love. The re-living and the remembrance, the quest and the questioning keep alive the love for the one who has died and give expression to their worth. The governor of West Flanders, Carl Decaluwé and Stuart Rivers exchanged video messages which were shown to the congregations in Dover and Zeebrugge. After the service, family members affected by the disaster joined together on the Prince of Wales pier to commit wreathes to the sea in memory of their loved ones.